On this web page I'll go over the process of how to make a waterfall with a rainforest theme. only recommend building this for recreation and not for a pet. route might be buying one from the pet store. As with every project on this website -if you attempt to build this waterfall it is at your own risk, specifically a your pet's own risk. Lizard-landscapes.com cannot be held responsible for accident or injury pertaining to the use of the techniques described on this website. Please do your own research beyond this web page pertaining to waterfall construction ideas. The more knowledge you have will better equip you in building your own waterfall landscape. With this particular waterfall model I decided to try and construct a slightly different design than the other waterfall projects on this web site. 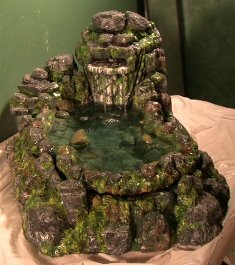 I've tried to create a waterfall design that is somewhat easier to clean and maintain whereby you don't have to siphon out the water or require help in order to carry the structure to where you can dump the water out. Check out the video below on how to make a waterfall. You might check out my other waterfall landscape project, instead of a rainforest waterfall it's a desert canyon waterfall theme. 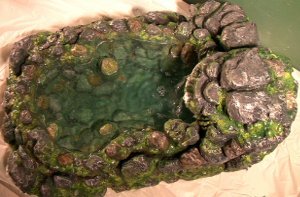 As with all of the fake rock projects on this web site this waterfall model was made using polystyrene sheets, adhesive, non-sanded grout, acrylic paint, acrylic non-toxic sealant, aquarium grade silicone sealant, and non-toxic colored sand. When thinking about your waterfall construction -you need to research a particular type of waterfall pump. You need to figure out how large you want the waterfall landscape to be. I used a waterfall pump called Tetra Repto filter, it can handle up to 20 gallons of water and features a three stage filtration system. Creating your indoor waterfall can be a fun but extremely challenging and potentially frustrating experience. 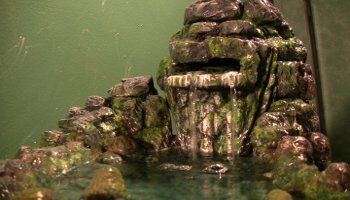 The main idea behind this waterfall project and the other waterfall on this web site is to camouflage the water pump/filter, so that you can possibly achieve realistic waterfall scenery. It's the act of hiding or camouflaging the filter/water pump that is so challenging and yet it's the only way your waterfall construction can look realistic. Be sure to check out the videos above on how to make a waterfall, as there is nothing quite like being able to see and hear an explanation at the same time. 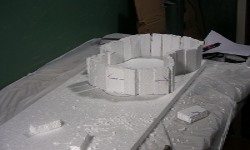 I made this waterfall model by cutting out various sized shapes of polystyrene which is Styrofoam. I then glued them together with a product called Loctite's power grab. This waterfall construction consisted of three separate pieces. The first piece is a large piece that holds the second piece. The second piece is the pond in which the water flows. I made this piece somewhat small so that it can be easily lifted out -so the water can be dumped and changed quickly. The third piece acted as a camouflaging helmet that would go over top of the water pump. The size of all of these pieces will of course depend on the size of the waterfall pump you choose to use. After finishing the process of making a basic rainforest waterfall model I move onto the stage of covering it in three layers of non-sanded grout. The videos above explain this a lot better than what I can do in wrote. Once the grout is applied I tested the waterfall model out. You'll want to test the waterfall construction to make sure it works and to see if it looks good when operating with the waterfall pump. Homemade waterfalls can be prone to leaking, so doing test after test until you find it to be sound is a very good idea. After I had a successful test I proceeded to use various colors of acrylic paint to add lots of detail. In trying to get ideas for your project you might search on the Internet for waterfall scenery. Waterfall landscapes is another good term in which to use to get ideas in order to add more realism to your project. After I was finished with the painting stage I proceeded to seal the project with many layers of non-toxic sealant. I used a product called Shields All which is a non-toxic acrylic sealant for all surfaces. I applied four layers of this sealant to every square inch of each piece allowing at least 24 hours (more is better) of dry time in between each coat. Your waterfall model also needs a layer of aquarium grade silicone sealant. I smeared one layer of silicone all over the surfaces that would have water on it constantly. I then let the entire thing dry for about a week before rinsing it off with water. 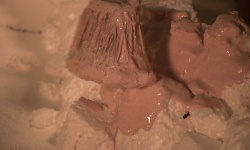 Even though aquarium grade silicone is non-toxic when dry, it is incredibly toxic when wet. When applying silicone in this waterfall construction you need to wear plastic gloves, a professional gas mask and professional goggles to protect yourself from the fumes. Ideally you need to apply the silicone outside so there is plenty of ventilation. As a last stage I sprinkled colored sand over certain parts of this Waterfall. This is done in part to counteract the shinyness that the acrylic sealant leaves behind. In your quest for how to make a waterfall -research other web sites that also discuss making a waterfall model as their ideas on waterfall construction might provide something different from which you can learn.